Couples journey into marriage expecting to be happy and blissful. What better time of year to marry than the fall when Mother Nature puts on her spectacular show of color? Vibrant reds, gold's, brown, yellow, maroon and greens dominate the landscape and are a lovely backdrop for pictures. It's also no surprise that couples are choosing to marry in the autumn, as the weather is usually cool and dry. A floral fall bridal bouquet will hold up much better than a bouquet that is exposed to the extreme heat of the summer or cold winter months. There are so many ways that you can incorporate the beauty of the dazzling fall colors of red, yellow, orange, and maroon into your bridal flowers. 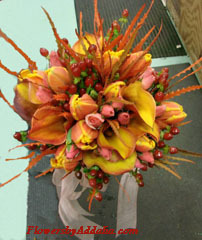 The above autumn wedding bouquet was created using fall bridal flowers that are easily obtained during the autumn months. Scattering some crystals throughout this bridal bouquet will give the effect of a "sparking bouquet" once the light hits the crystals. With an abundance of berries and fall foliage at your disposal, creating a fall bouquet is not difficult. Check with your florist or recently married friends for more ideas. Sunflowers are native to the Americas and possess large vibrant flowering heads. 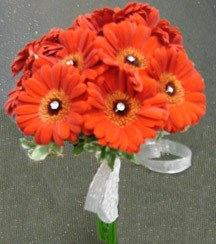 They are a sturdy flower and their magnificent blooms brighten up any bouquet. 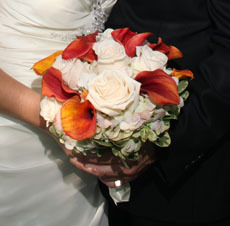 This simply elegant fall wedding bouquet, takes advantage of the abundant fall sunflowers. The deep greenery and white satin ribbon helps the sunflowers to stand out. Chrysanthemums or mums are available in a wide variety of fall colors including, white, yellow, gold, bronze, red and burgundy. They are a hardy flower and work well with many other fall flowers. 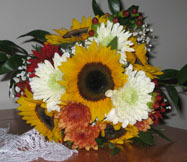 This lovely bouquet was created using several shades of mums, sunflowers and baby's breath. The greenery in the background sets off the autumn colors. 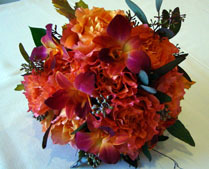 Roses are always a popular wedding flower and are available in a wide array of autumn colors. Red roses are extremely popular with brides as they signify love and passion. Yellow roses signify domestic happiness. White roses signify unity, loyalty and a love stronger than death. Dried grasses such as: wheat or rye add texture to a fall bouquet and look especially beautiful with mums. Some brides choose to have their bouquet made from cotton ticking and bows with lace accents. You can incorporate rosettes with pearls, crystals or beads to accent your bouquet. If you're planning on making your bouquet yourself go to a fabric store and ask if they will be offering any classes on "How to make your own bouquet." If they don't have any classes, check the internet, library or bridal magazines for ideas. Start practicing about three months before your celebration day to ensure your bouquet turning out exactly as you desire. These are just a few ideas for an autumn wedding bouquet. Please take a look at my links below for more autumn and fall ideas. Your wedding is probably the biggest event you will ever plan so let's do it right. Please go to my Welcome page and start your planning.